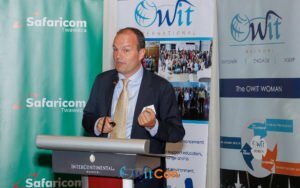 The Organization of Women in International Trade (OWIT) – a non-profit, professional organization that supports the advancement of women in international trade and business – held its 18th Annual World Conference in Nairobi, Kenya, in partnership with OWIT’s Nairobi chapter. Alliance Director Philippe Isler participated in the event, describing the Alliance’s work in modernising the cross-border movement of goods and the importance of trade facilitation to women’s economic empowerment, particularly in developing countries. Philippe’s presentation also looked at how public-private partnerships are vital to identifying problem areas in customs processes. The theme of the conference was “Bridging the Gap: Empowering Businesses to Go Global”, convening nearly 200 multinational enterprise representatives, entrepreneurs and small business-owners, trade policy-makers and advocates, leadership from international organizations, and officials from the Government of Kenya and the U.S. Embassy. The day before, on October 24, OWIT hosted a daylong capacity-building workshop for 50 local women entrepreneurs on various aspects of engaging in international commerce, including shipping goods across borders, identifying buyers and sourcers, and building strategic alliances around the world. The Alliance will continue to engage with OWIT chapters in Kenya and other project countries to hear directly from the source about what gender-based barriers to exporting should be addressed in order to further enable economic growth. Find out more information about OWIT and its Kenya chapter at www.OWIT.org and www.OWITNairobi.org.